Valka swung down from the black stallion and stood at the edge of the trail winding down the mountainside. While the horse buried its muzzle in a spring bubbling up in a cluster of rocks, he looked around. He had spent most of the day riding through a pass cutting a mountain range in the east, and he was now on the downside of the western slope. Snow-clad peaks pierced a blue vault where eagles wheeled, sharp black eyes searching the wooded slopes for prey. Bamboo groves swept the inclines on either side of the trail, slender shafts bending gracefully under a southern breeze. Valka spotted grey plumes of smoke drifting above the trees further down the slope. Chimney smoke from a mountain village, he guessed. The flaming orange ball of the sun rolled toward the horizon, and the coolness of approaching evening crept softly over the mountains. After the arduous trek through the pass, Valka welcomed the prospect of hot food and warm shelter for the night. A woman’s scream shattered the stillness. Valka’s sword was a streak of blue light as it leaped into his hand from the scabbard hanging down his back. He faced the bamboo grove covering the lower slope, his sword held before him with both hands. Knotted stalks rattled agitatedly as someone raced through the grove. Further back he heard sounds of crashing, snapping, and furious curses of men pursuing the fugitive. A woman broke from the bamboo twenty feet down the trail. Full breasts heaved against her homespun cotton blouse. The woolen skirt covering her long legs was torn, and her short leather boots were scuffed and muddy. A tangle of lustrous black hair framed a pretty face, and dark eyes rolled with terror. Spotting Valka, she exclaimed with relief and ran toward him. “Save me!” she cried. Six men burst onto the trail, saw her running and started in pursuit. Then they noticed Valka and slid to a halt. A glance told Valka they were not ordinary mountain peasants. Hard eyes glittered cruelly from predatory faces. Mouths compressed to grim lines. They wore fine cotton shirts and finished leather trousers. Leather boots were strapped up their calves. But what caught Valka’s attention were the well-crafted long swords shimmering like liquid silver in the afternoon light and the capable way they held them. Clearly, he was facing professional fighting men. The swordsman rocked back on his heels and looked Valka over. His gaze passed over the shoulder length black mane sweeping back from a high forehead, and cold grey eyes. He noted the scar streaking like crimson lightning from above Valka’s right eye, crossing his high-bridged nose and ending on his left cheek beside his wide, thin-lipped mouth. His eyes lingered over Valka’s broad shoulders, muscled chest and ribbed stomach, all etched with scars. The sleeveless sheepskin vest he wore exposed arms corded with muscle and brown from the sun. But it was the sword Valka held in his scarred fists that riveted the man’s attention. The curved, single edged blade shimmered like blue flame in the sunlight, causing the twin dragons etched into the translucent steel to come alive and spit fire. When his gaze finally returned to Valka’s stony face, his eyes held caution and respect. The men behind him saw the same thing and shifted uneasily. Yellow flames flared in Valka’s eyes, but he only stared grimly at the swordsman. The men fanned out around the leader, swords at the ready, and approached Valka. Valka watched them advance. He could tell by the way they moved that they knew what they were doing. They were wary, like hounds that had cornered a stag. But they were confident of their skills and did not believe one man could defeat six. Valka waited until they came within lunging range then took the initiative. The man on his right twitched nervously, as if he were afraid, and Valka attacked him first. As the man raised his sword in preparation for a downward stroke, Valka moved diagonally, taking himself from under the blade. At the same time, he brought his sword around in a horizontal stroke and disemboweled him. Halting in mid-stride, the man hung rigid with shock and watched his guts pour in a glistening red heap onto the dirt. Valka pivoted, swung his sword back around and sheared through his spine. The man dropped to the ground like a lead weight. 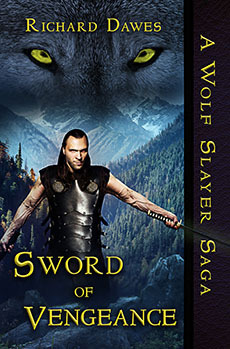 Without pausing, Valka drove his blade into the chest of the next man in line. He had positioned himself so that when the swordsmen turned to face him they stood strung out in single file. They must either attack singly or take precious seconds to shift position. In that moment of hesitation, Valka struck again. Freeing his sword from the falling body, he leaped forward. With all his body weight in the stroke, he sliced the leader from crown to groin. The two halves of the body dropped to the sides, and blood, entrails and internal organs splashed onto the dirt. Snarling with rage, two attackers raised their swords and charged Valka at the same time. He ducked in beneath their swords, brought up his blade in a sweeping cut that sliced one man’s stomach then continued on across the second man’s chest. They faltered, grunting with pain. With the speed and grace of a panther, Valka sprang into the air, turned, swung his blade in a blood-spattering arc and sheared off their heads. Blood sprayed the bamboo grove as skulls bounced off down the trail. Landing ankles-deep in a grisly bog of blood, entrails and body parts, Valka faced the last swordsman. The man’s stunned gaze passed over the corpse-littered ground then he stared at Valka in terrified awe. Sunlight streamed through a crimson mist that drenched the atmosphere, creating the grisly impression the air dripped with blood. Valka stood intransigent in that scarlet spray, black hair standing straight up, eyes blazing with the fires of hell, teeth bared in a snarl of blood lust. Terror strangling the man’s voice, he cried, “You are a Demon of Death!” Then he spun about and fled into the bamboo grove. After taking a moment to allow his heart to stop pounding against his chest, Valka bent, ripped a sleeve from the shirt of a corpse and used it to wipe the gore from his blade. Valka watched the sun dip in a purple blaze behind the western slopes, washing the treetops with scarlet flame. Long fingers of shadow stretched across the ground, and the breeze carried a chill. The air was rank with the stench of mutilated bodies, voided bowels and shattered organs.